New versions of Total Access Statistics are available for Microsoft Access 2016, 2013, 2010, 2007, and 2003. Existing Total Access Statistics owners were notified to download the update. Download the free trial version today! Existing customers can upgrade at a discounted price. Total Visual Agent, the world’s most popular maintenance scheduling tool for Microsoft Access/Office and Visual Basic 6 (VB6) is now available for Microsoft Access 2016 (and earlier). This is the ninth major release of Total Visual Agent and introduces many enhancements to automate maintenance chores easier than ever. To keep your Microsoft Access databases healthy, you need to regularly compact them. For disaster recovery, you should also be making backup copies of your database regularly. You may also have regular tasks such as printing reports that are performed regularly. Total Visual Agent does this and much more on a schedule you specify. Run tasks hourly, daily, weekly, monthly or just one time. Perform database chores, run Access macros or Windows command lines. A complete audit trail is maintained, and you can even be notified by email if something goes wrong. Total Visual Agent can also be run as a Windows service to restart if the machine reboots and for added security since a user doesn’t need to be logged in. 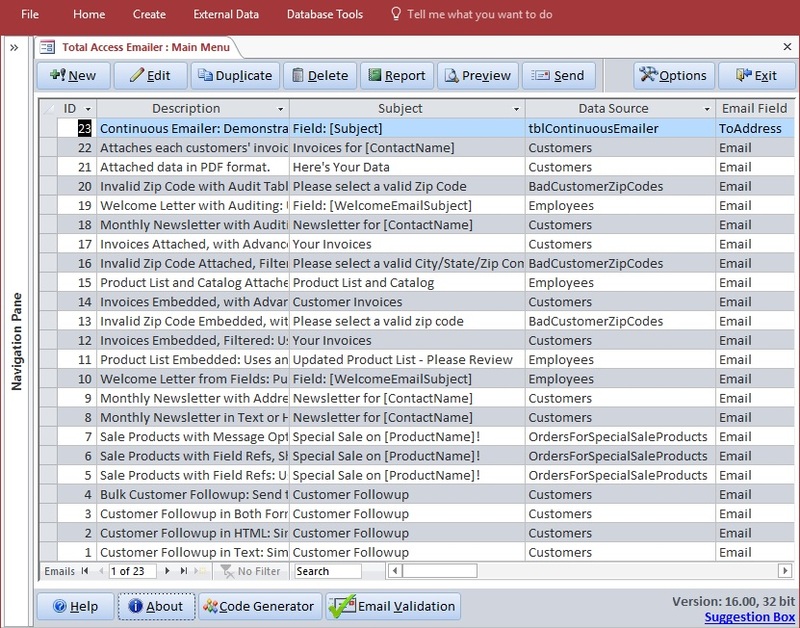 Total Access Emailer is the most popular email blaster for Microsoft Access. Easily send personalized emails directly from your Access database. Quickly communicate with every email address in your table or query. Use fields from your data source to customize each subject and message. Attach files from disk and also attach reports as PDF files filtered for each recipient. Save Attached Files to Disk. This lets you document the attached files sent to all your contacts without using blind cc (Bcc). This can also be used independent of sending emails as a way to distribute files and PDF reports to disk. You can even create folder names based on field values. Complete list and additional details of new features. Total Access Statistics is now available for Microsoft Access 2016 (32 and 64-bit versions). Running as an Access add-in Wizard, Total Access Statistics generates a wide range of numerical analysis beyond the power of queries. All results are in Access tables that you can add to your queries, forms and reports. Total Access Statistics includes a VBA programmatic interface with a royalty-free runtime distribution library so you can add the advanced analysis into your Access applications for distribution to others. Download the Free Trial to experience it yourself. Owners of Total Access Statistics for earlier versions of Microsoft Access can upgrade at a discounted price.